Insanely Twisted Shadow Planet is getting some insanely twisted Co-Op DLC. The response to the 3rd game in this year's Summer of Arcade lineup, Fuelcell's Insanely Twisted Shadow Planet, has been decidedly mixed. I can see why some don't care for it. It's a game that eschews the usual carrots used to lead gamers through a campaign relying instead on Michel GagnÃ©'s fantastic art design to motivate players to see more of the game's world. There are no characters, no dialogue and no story, save the vague premise of fighting against an all-consuming black mass. It's a lonely experience. It's also a very very short one, especially given the game's full 1200 MSP price point. While a batch of DLC certainly won't make the game any cheaper, it will add more content and another Co-Op multiplayer mode, perhaps making your journey though the bowels of Insanely Twisted Shadow Planet a little less lonely. While Insanely Twisted Shadow Planet already has a multiplayer mode in the form of the nerve wracking Lantern Run mode, which sees a group of gamers work together to carry lanterns away from an unstoppable black mass, the upcoming DLC will apparently contain gameplay more akin to the slower paced puzzle solving of the central campaign. Talking to Eurogamer, Fuelcell's CEO Joe Olson mentioned that the game was at one point "a lot bigger" and that we may see some of the ideas that went unused incorporated into the DLC. He also talked about the media's mixed response to Shadow Planet, insisting that some of what some outlets called faults were actually deliberate design decisions. Regarding the game's stark lack of clear objectives he said, "It was a conscious decision on our part to leave that open. Even on the story side, we did it in a style that has no words, no text, no dialogue. Take from it what you will, add to it, it is what it is." He also went on to add, "Other people seem to ding us on the fact that we're not pounding you over the head with the task hammer every second to let you know exactly what you have to do next." While I don't exactly agree with his tone, I do agree with Olson's sentiment. 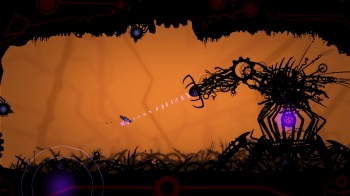 While admittedly short and somewhat intimidating, Insanely Twisted Shadow Planet is a superbly crafted game and, in my opinion, a successful experiment in narrative minimalism. Insanely Twisted Shadow Planet is available on Xbox Live for 1200 Microsoft points as part of the Summer of Arcade promotion.